Sony a7R III and a7III cameras are the company's latest high-resolution full-frame mirrorless bodies. 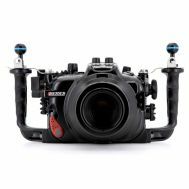 A professional housing befitting of a top-of-the-line camera, the NA-A7RIII underwater housing provides fingertip access to all key camera controls in a rugged and reliable aluminum underwater housing. Ergonomic camera control access is one of the defining strengths of a Nauticam housing, and the NA-A7RIII continues this tradition. Essential camera parameter changes are made from the handles, without awkward reaches. The NA-A7RIII housing inherits the core design elements from the Nauticam pro DSLR range, and bundles them in a more compact package. A patented port locking lever allows lens changes to be made in seconds. Opening the housing for quick battery and media changes is fast and easy with the locking housing latches. All aspects of the system are a seamless extension of the camera. Sony a7R III 42.4MP Full-Frame, 10 fps, 4K with 5-Axis IS in a Mirrorless! The Sony a7R III is the company's latest high-resolution full-frame mirrorless camera. Following hot on the heels of Nikon's recent D850 release, Sony's newest full-frame camera also combines resolution with high speed shooting and fast autofocus capabilities to a degree we've not previously seen. Achieving an overall DxOMark sensor score of 100 points, the same as the Nikon D850 makes the a7R III the highest-scoring mirrorless system camera to date, beating out its predecessor, the a7R II. The a7R III is built around a 42MP BSI CMOS sensor that delivers up to 15 stops of dynamic range and can shoot up to ten frames per second (8fps with no viewfinder blackout). UHD 4K footage can be captured either from the full width of the sensor or from a Super 35 size crop. The camera can also shoot 1080p video at up to 120p and has a function to conform this footage back down to 24 or 30p, if you want out-of-camera slow-mo. These functions are also available from both the full width of the sensor or from the cropped region. 5-axis image stabilization ('Steadyshot') is available in all modes and the ability to shoot in Hybrid Log-Gamma (HLG) adds support for an HDR video workflow. The a7R III inherits many of the handling and speed improvements from the pro-sports model a9. This means faster processing, improved autofocus, and ergonomics, as well as the adoption of a much larger battery! The new Sony a7III body is the latest model of this popular camera. It features a full frame mirrorless 24.2 MP sensor that offers 14 bit RAW imaging at 10 fps. The sensor itself is 5-axis stabilized and features 693 phase-detection AF points covering 93% of the image area in addition to 425 contrast-detection points. The A7 III is able to capture UHD 4K at 30p and 100 Mbit/s and includes Hybrid Log Gamma as well as Sony S-Log. Sharing the same lens port accessories as the Nauticam NA-A9 and NA-A7II housings, a list of thirteen Sony FE mount lenses are currently supported. An adapter allows the entire N120 DSLR lens lineup to be used as well, supporting the popular Canon EF lenses attached to the a7R III with an EF to Sony E mount lens adapter. Also available is an adapter to attach the water contact UW-Nikkor series lenses originally used on the Nikonos underwater range finder systems. From ultra-wide fisheye lenses to long macros, the Nauticam A7RIII system has all focal lengths covered. 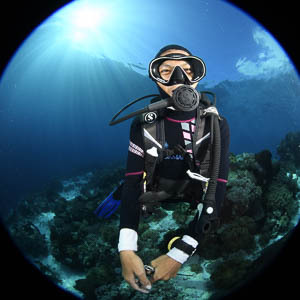 Inspired by the water contact lens designs of decades before, Nauticam is continually developing new optical accessories that raise the bar of what is possible in underwater imaging. Designed with modern lens-design software, and fully optimized for in-water use, these lenses provide significantly better performance than an in-air lens behind a dome or flat port alone. An optional LED flash trigger (26302) provides rapid fire strobe triggering with optical slave strobes over fiber optic cables. A new universal fiber optic cable set (26216) provides reliable triggering with all popular optical slave strobes! Flash systems that use electrical sync cables can be connected to a Nikonos Bulkhead and Hotshoe (25056).